Men and women of all ages can benefit from taking a daily multivitamin. In order to function properly, our bodies require certain nutrients that we simply can’t make on our own. Eating a well-balanced diet of whole foods is the best way to get the essential vitamins and minerals your body needs. Unfortunately, most Americans fail to meet dietary recommendations. For many reasons, including strict dieting, poor appetite, changing nutritional needs, or less-than-healthy food choices, most Americans don’t get the nutrients they need from food alone. While not a substitute for a healthy diet, taking a multivitamin is a safe, easy way to fill the small nutritional gaps that many Americans face on a daily basis. Am I Prone to Nutrient Deficiency? Some people are especially prone to nutrient deficiency. Seniors, menstruating women, pregnant women and vegetarians or vegans may miss out on essential nutrients due to poor absorption, fluctuating needs and limited food choices. “If your diet eliminates whole food groups or you don’t eat enough variety of foods – you would benefit from a once-daily multivitamin,” says Karen Ansel, spokeswoman for the American Dietetic Association. The Linus Pauling Institute’s Micronutrient Information Center at Oregon State University suggests taking a multivitamin/mineral supplement with 100% of the Daily Value (DV) for most vitamins and essential minerals to maintain health. 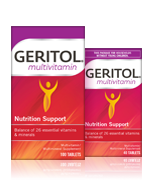 Geritol® multivitamin contains every vitamin and mineral established as essential in human nutrition, including 100% RDA of vitamins C, D, K, B1, B2, B6, B12, niacin and folic acid. Who should not take a multivitamin? Some people should avoid taking multivitamins. If you’re being treated by a doctor for a condition and you’re taking medications, talk with your doctor before taking a multivitamin. Dietary supplements could affect your treatment. Additionally, adding a multivitamin to a steady diet of other, single-nutrient supplements or highly fortified foods could put you over the top for several vitamins and minerals. If you have questions about whether a multivitamin is right for you, talk to your doctor or a dietician/nutritionist. Not Too Little. Not Too Much. Some vitamins contain well in excess of 100% of the recommended daily allowance (RDA), but Geritol delivers the right balance of nutritional support. Geritol® multivitamin is specially formulated with just the right vitamins in just the right amounts so you can feel your best! Vitamins and Minerals: Understanding Their Role. HELPGUIDE.org, Colloboratoin with Harvard Health Publications; Harvard Medical School. Retrieved from: http://www.helpguide.org/harvard/vitamins_and_minerals.htm January 10, 2012. Elizabeth M. Ward, MS, RD. 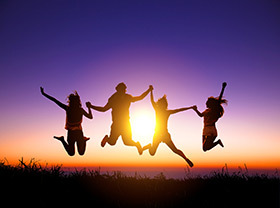 Making the Most Out of Multivitamins: Vitamins and Supplements Lifestyle Guide. 2005-2013. WebMD. Retrieved from: http://www.webmd.com/vitamins-and-supplements/lifestyle-guide-11/making-the-most-out-of-multivitamins January 10, 2013. Kathleen M. Zelman, MPH, RD, LD. How to Choose a Multivitamin: WebMD Ask the Nutritionist. 2005-2013. WebMD. Retrieved from: http://www.webmd.com/vitamins-and-supplements/nutrition-vitamins-11/choose-multivitamin January 12, 2013.